<<< See “TIM-O: Beginning an Observation” for the introduction to this tutorial. To create a TIM lesson profile using the question-based method, check the second radio button for Matrix-based. Select the school where you will be doing the observation. The dropdown Select School menu will present you with a list of all schools where you have been assigned as an observer. Next, select the teacher’s name from the Select Teacher dropdown list. This list will be populated with every teacher at the selected school who has been entered into the TIM system. Always keep in mind that the unit of observation in the TIM-O is the lesson, not the teacher. You are selecting the name of the teacher whose lesson your are about to observe. Figure 1. Selecting the teacher to observe after the school selection has been made. When you have made your selections for method, school, and teacher, click the Begin an Observation button. A blank Matrix of Summary Indicators will appear. Figure 2. The Technology Integration Matrix with no selections yet made. After careful observation of the lesson, simply click within one box in each row to select the levels you observed for each of the five characteristics. Your choices will highlight and will be recorded in the system. You can change your selections as many times as you wish. Remember, you are determining your choices based on classroom activity that you can readily observe. It is a profile for that particular lesson, not a profile for the teacher. You may happen to know that the teacher whose lesson you are observing is capable of presenting a lesson at the Infusion level for Active Learning, but if the particular lesson you are observing is at the Entry level for Active Learning, then that is the cell you should check. As you select cells in the Matrix, the background will highlight as shown below. Figure 3. The cells will highlight as you make your selections. As you are determining the level for each of the characteristics, you may find that you need more information than is provided in the high-level summary the matrix view provides. In that case, select Lesson Detailed Indicators in the menu to reveal a sub-menu listing each of the five characteristics. Click any of the characteristics and you will see extended descriptors for the teacher, the student, and the setting at each level as shown below for the Active characteristic. Figure 4. Detailed indicators for the students, teacher, and setting will help you to select the most appropriate level for each characteristic. 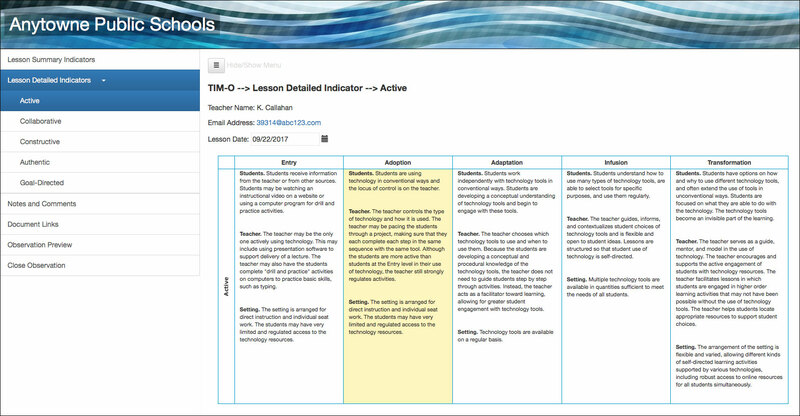 The Lesson Detailed Indicators windows work just like the overall Matrix window. You can click in any cell to select it. You may go back and forth among the five indicators and change your selections as ofter as you would like. 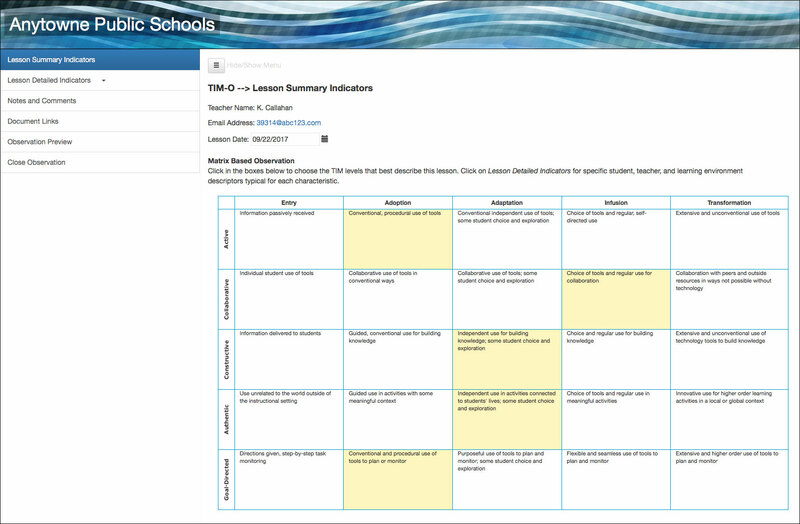 When you have made selections for each of the five characteristics, go back to the Lesson Summary Indicators to see all of your choices on one screen. From this point forward, the process is the same to complete an observation using either the question-based or matrix-based method.